County Series maps of Great Britain, scales 6 and 25 inches to 1 mile, published by the Ordnance Survey, Southampton, Hampshire, from about 1863 to 1948. Map of the Meetings belonging to the Quarterly Meetings of Lancaster, Westmorland, Cumberland, Northumberland, Durham and York, scale about 9 miles to 1 inch, by James Backhouse, engraved by Thomas Kitchin, published by James Backhouse, Darlington, Durham, 1773. Meeting house. 1688 with later alterations. Roughcast with some slate hanging and slate roof. 3 bays, the 3rd bay with lst floor, and low wing to right return. 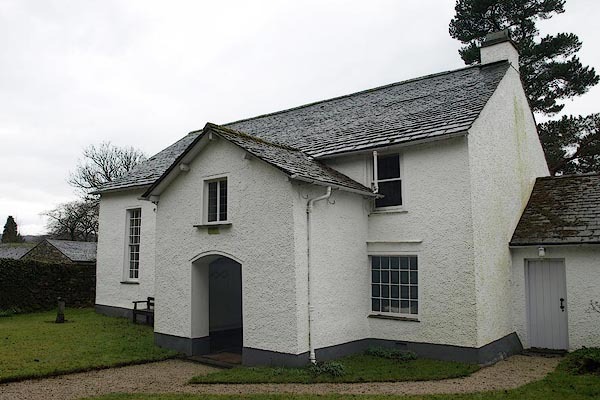 1st 2 bays have tall sashed windows with glazing bars, inserted in 1790. 3rd bay has window with small-paned fixed glazing and opening pane under dripcourse; sashed window above. Large gabled porch has segmental-arched opening with 2-light casement above, with leaded glazing. Gable-end stack and small wing with C20 door and casement. Left return has 2 double-chamfered cross-mullion windows under label mould with slate hanging over, and roughcast apex. Rear has one 3-light double-chamfered mullioned window with transom to 1st bay. Interior: Porch has wide-boarded doors with wood locks and strap hinges to meeting room and schoolroom. To left, hat pegs; to right wide-boarded doors with H-L hinges, one to stair. Meeting room has beams with stepped stops and fielded panelling and possibly later dais. Partition to schoolroom with balustrade to gallery above; upper panels can be slid up to screen off gallery. Schoolroom has fielded panelling and fixed benches; upper panels to partition can be lifted up to open room into meeting room. Small stone fireplace. Winding stair to gallery has plank and muntin panelling. .
Burial ground walls. 1658 with later extensions to south, now enclosing area approx 15m x 40m. Stone rubble walls to 4 sides, with entrance to north. Inner face of north wall has stone benches; remains of similar benches to inner face of east wall to north end. Entrance has stone lintel with slate dripcourse and C20 paired doors. Land bought in 1658; indenture describing burial ground dated 1669. This is a very early example of a burial ground of the Society of Friends. hearsay The quaker meeting house was built 1688, before the Toleration Act 1689. Earlier meetings were held in secret, sometimes in the quaker burial ground which was begun in 1658. The burial ground is up the road on the left. At first there were no headstones of any sort. 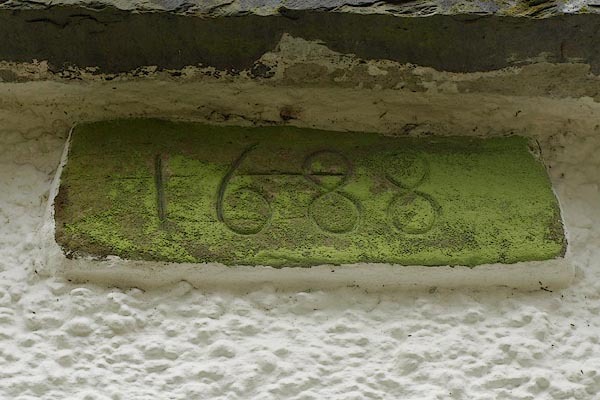 From later in the 18th century simple round grave markers were used, inscribed with just a name and date.